The original part of the house was built in the 1800s. Since then a few additions were added, and with those additions fiberglass insulation was put in. On this end of the house a dining room and a bathroom were added around 1985. I could sense 'bad air' coming from the basement. But exactly where was it coming from? It was time to investgate. 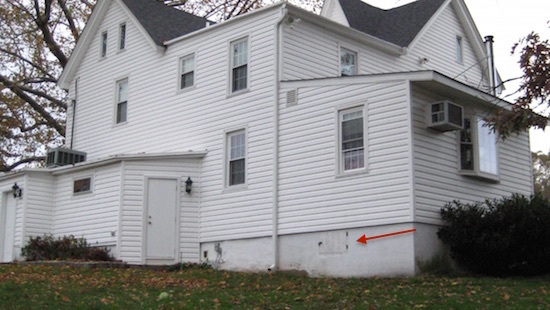 This is a hatch leading to the basement crawl space under the addition. 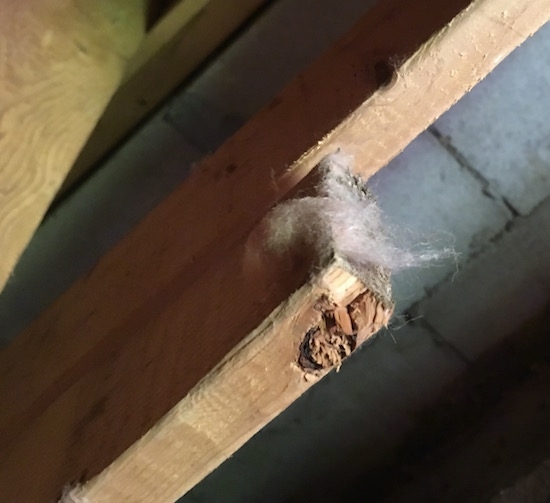 ...and discovered 35 year old fiberglass insulation. Oh gross. That has to go. After 35 years the tiny, microscopic shards of glass become brittle, shatter and float around. 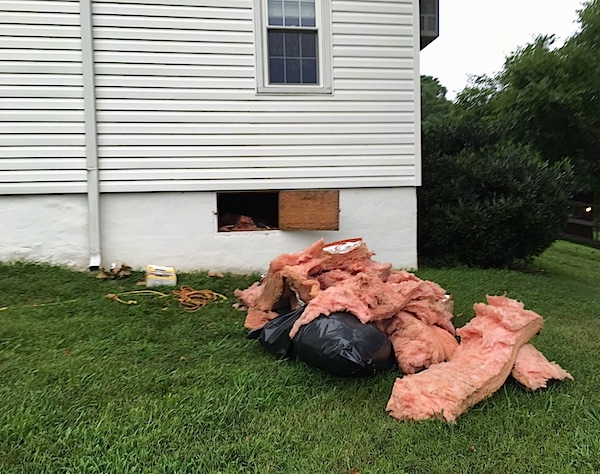 It was leaching through the crawl space into the basement and up the basement steps. Humid summer and windy days were always the worst. Time to call the fiberglass removal company to clean that out. 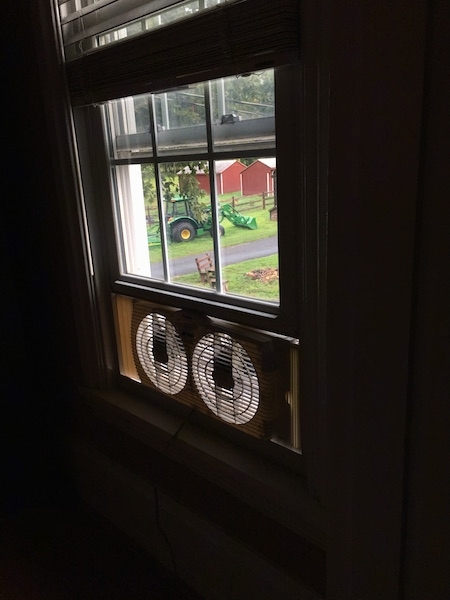 We set up a fan on the opposite side of the house blowing fresh air in to push the contaminated air out, creating a positive pressure while awaiting the fiberglass removal company appointment. 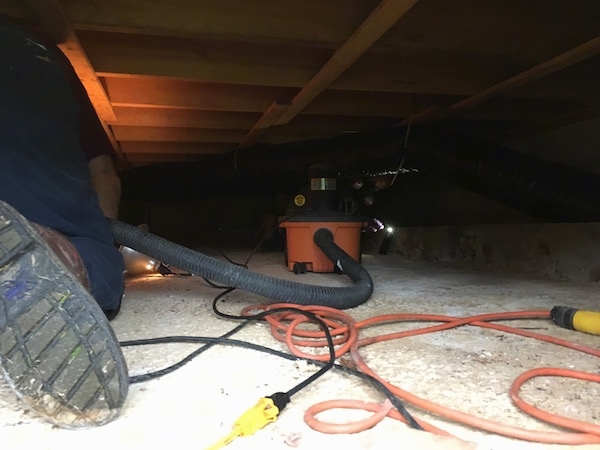 We did this to keep the basement air from coming up, but I also noticed that the air in our upstairs bathroom also improved. I often feel 'bad air' coming from under the upstairs sinks. There happens to be fiberglass behind the bathroom walls that was added during past renovations in about 2001. When the fan was turned off and the basement air would back up into the house, not only would it make me sick, the dogs would sneeze repeatedly. On one of the very hot summer nights we decided to run our bedroom AC and keep the window closed while we slept. The next morning I walked half way down the stairs and immediately felt bad air. The dog was at the front door asking to go out sneezing over and over. I ran back up the steps and put the fan in the window on high. After a few minutes the air improved. The big day finally arrived. 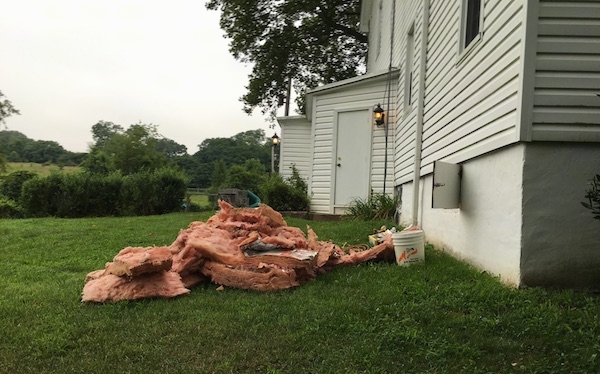 The fiberglass removal guys showed up and bagged up all of the insulation. There was still more inside the crawl space when this picture was taken. I could not hang around any longer. It was making my lungs hurt and I had a hard time not throwing up. The dogs were sneezing and Mia the American Bully ate grass all morning. Her stomach must have been bothering her, too. All of the little pieces had to be cleaned up.